The perfect Reminder Laura. I’ve got my birds all ready to post. I love your little bluebird. Have a beautiful tweetie day! You’re so organized, Sharon! I did this one this morning and not even sure what image I’ll try rendering for Friday lol! 😀 No time for anything but work and sleep at this time of year. Glad you enjoyed this! Tweet tweet! I’ll look forward to Friday’s post! Tweet! Charlie is a great WordPresser and Doodlewasher! Love your bird, too, it’s so well done, Laura. LOL! I would have to despise myself too, as I’ve not done mine either (well, no hurry to transmit when you’re not getting money back, that’s for sure)! I still have people who haven’t dropped their stuff off. Can’t say it thrills me, but I could always bump their fees, hehe! (More money for art supplies needed!) BTW, this little painting was done on one of the Blick samples – the 300# Arches cold press. I can see why you love it. The 140# is definitely “fiddle-able” too, but this one is even more so, just as you said. I’ll definitely be placing my order! You’ve sold me with the beautiful stuff you’re rocking out the door as well! If it weren’t for you, I may still be using those Strathmore watercolor cards, lol. Sure glad we crossed paths, you Diamond Crazy WC sistah’nista! OK and I just mentioned this to C – you heard of Jean Haines? If not, you should seriously check out her books. This impressionistic style is one I’m trying to learn from and it is so similar to what you’re doing also! I do have one of her books 🙂 Amazing! Thanks so much, Carol! Somehow your comment wound up in spam by mistake. Probably my tax season exhaustion lol. You’re very kind as always with your comments. Thanks. Thanks so much, Snehal! IMO, you’re one of the best watercolorists here on WP so I really value your praise & encouragement, friend! Your stuff so rocks. I am not worthy *bowing* 😀 Charlie is so wonderful; I totally agree. He is a shining light here on WP! AMAZING! I would recognize that face anywhere! Thanks, Carmel! I really appreciate it! A real tweet – what a marvellous watercolour! And, of course, yay for Charlie! Yay for Charlie, so we’ll put Laura, but also a big big, yay for you too, equal measures! What a sweat little bird, I love them too, but we dont get them here in the uk. Thanks, Rebecca! I definitely need more practice with WC, but it was fun to do this painting for my mom. Hee-hee, a flap-up! 😀 Your bird is super beautiful. Your watercolour painting skills are not one bit rusty; they look like they’ve got great flow actually. And you are so good at capturing the 3/4 portrait personality of so many animals! Thanks for getting up early to create this little cutie. You’re very sweet; thanks so much, Myriam! Nice job! Love it. I need to remember to do a bird on Friday. Looking forward to seeing it, Teri! Thanks, Donna! Your and Kathy’s photos are hard to resist! Hi Kerfe, considering I’m just leaving the office at about 8pm…..not sure I will have time to get another one prepared for tomorrow. I do hope I’ll have Sunday off though, so if worse comes to worst I’ll be able to post one then, I hope. Fingers crossed! Looking forward to see what everyone creates! That’s fine, you know it takes me awhile to put things together. I don’t envy you this next week! I have to remind myself how wonderful October is. Helps a lot. Laura, this Friday should offer lots of flappin’ fun!!! I will be among those flocking to your blog to see what wonderful art you post this time. Thanks, M.R. – may not be til Sunday due to work demands, but I will try my best to get another bird posted soon! Your Bluebird is beautiful! I love its eye, and the profile look. Thanks so much, Deborah! I do love eyes! I’d like to do more of these fast and loose wet-in-wet paintings. It’s funny how you kinda get out of practice though….I’m so used to the more heavy hand needed for acrylics. WC feels so strange now lol. Thanks, Denis! Bluebirds are so cute. They can really turn a grumpy eye when they want to, too! this is so beautiful and such a sweet face 🙂 your mom is sure to totally love this, it is lovely Laura!! What a beautiful bluebird! I love everything about how you painted this little fellow! Your mom is going to love this! Good luck getting through tax season, the end is near! And big cheers to both you and Charlie! Wonderful, delightful and talented people you two are! Thanks, Cathe *she says through the yawns* I’m wishing I could hibernate like a bear and sleep for about a month lol. haha, thanks! 😀 I like a birdie with moxie! Thanks so much, Adrian! 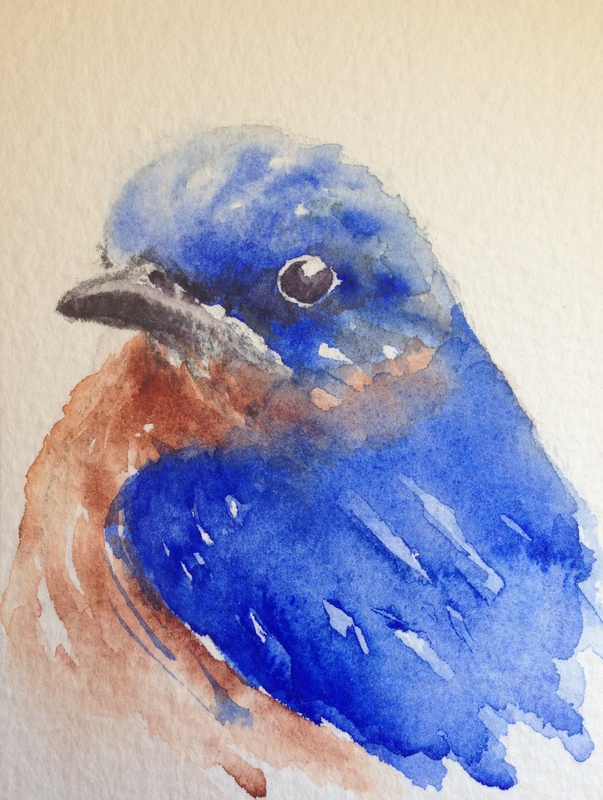 I really love bluebirds, and it was a joy to paint this one. Is birding what led you to photography, or the other way around?